A coming reshuffle of top army and police posts hints at possible divisions in Thailand’s junta. As Thailand’s military government pushes back its timetable for holding new elections deeper into 2016, speculation is mounting about the political significance of security force rotations due to take effect on October 1. Recent reports have portrayed competition for the top spots in the army and police as a tight pair of two-way races, with Prime Minister Prayuth Chan-ocha and powerful Defense Minister Prawit Wongsuwan believed to be backing competing candidates. Assistant Army Chief General Preecha Chan-ocha, Prayuth’s younger brother, and fellow Assistant Chief General Terrachai Nakwanich, a known Prawit protégé, are viewed as the frontrunners for what has traditionally been the security forces’ most powerful post. 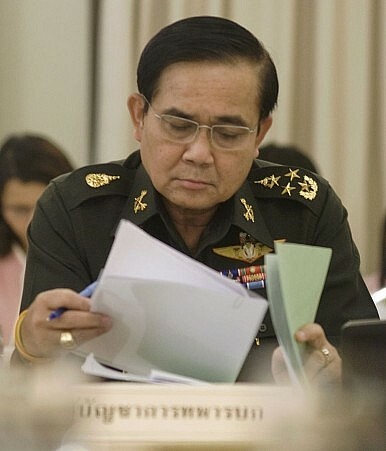 While both soldiers are firmly pro-coup, their bids are viewed by some as reflective of a budding power struggle between Prayuth and Prawit over their current and future political roles. Preecha’s star has risen in line with his elder brother’s ascendancy. A former helicopter pilot, Preecha until recently served as 3rd Army Region commander, where he oversaw security in the country’s drug-infested northern region. A 35-year military veteran, Preecha has served mostly in civil roles and possessed no intelligence or operations experience prior to his recent command-level promotions, according to a Thai military insider familiar with his career path.